I am late on jumping with this trend. Chalk paint has been out forevea. But I didn't really understand what was so great about it. So I waited while everyone else did their trials and read all the details on multiple blogs. Let's be honest. With the popularity of chalk boards everywhere (wedding decor, family photos, on random walls) I thought that chalk paint was simply colored chalkboard paint. And it is. But it's so much more. A few year ago Annie Sloan chalk paint became super popular. And then I saw people refinishing dressers, and beds, and other pieces of furniture in this "miracle paint". I just didn't understand WHY they would want to cover all those furniture items in something that can be written on. 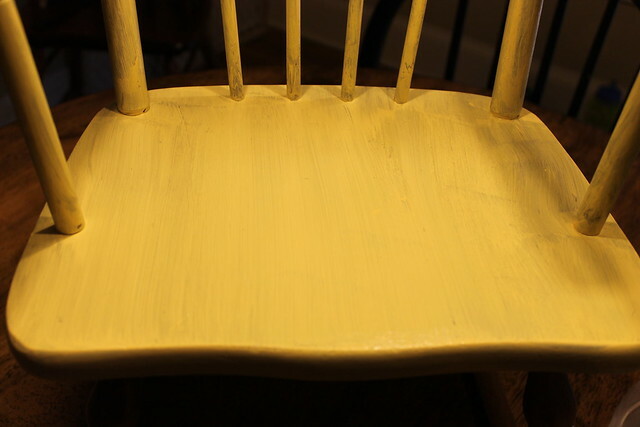 Then I came across a blog (maybe a year and a half ago- so I can't remember where) that explained that chalk paint can be used just like regular paint, but it takes the sanding/deglossing step out of the mix. Thus why people were using it on furniture. It really has nothing to do with chalkboards. Mind blown. I was still skeptical. No sanding? How is that possible? When I looked up this "miracle paint" and saw that it runs about $35 for a QUART (that's one color- for me one project), I knew it must be liquid gold. I mean seriously? That price makes shopping at thrift stores pointless when that $5 piece turns into a $40 investment. Ya know? I do think you can buy smaller "samples" but you still have to use their colors. Please don't misunderstand. I'm sure Annie and her magical paint is amazing. I've never used the Annie Sloan brand, so I can't make any determination about it. Ok disclaimer over. I knew there had to be a better solution. A cheaper solution. Because this SAHM doesn't have $35 to drop on every project. As I was searching on Amazon for chalk paint I came across this. My lovely family knows how much I love amazon and always gets me gift cards at Christmas, so I bought this back in January. It's basically 100% Calcium Carbonate. And this particular item is for a gallon of paint. When I read that I was defeated again. $20 for the additive. $20-$25 for the paint and I'm still in the $40 range for a project. Then I read the reviews and people listed the measurements to use for a quart and sample sizes. Duh! Sample sizes! Those tiny little paint pots that can be customized at HD or Lowes for about $3. It lived in our playroom. And I knew it would eventually get new life. We planned to have Emberly's 1 year pictures done in April and I knew this would be the perfect prop. I chose a happy yellow that would coordinate with her party theme and went with it. In a bowl I mixed about 1/3 of the sample, about 2 tablespoons of chalk additive and mixed. It looks lumpy in the bowl but brushes on smooth. 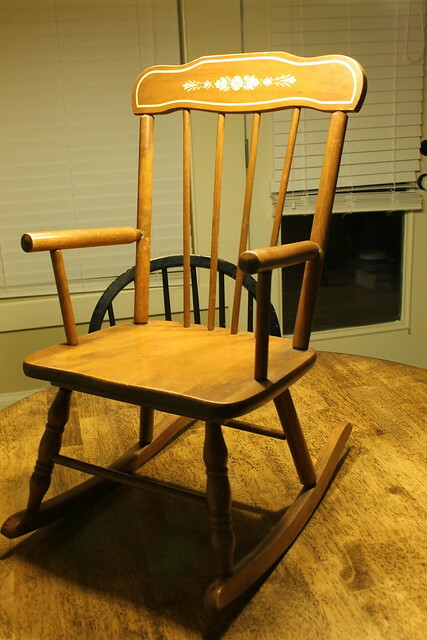 The only prep work I did to the rocking chair was clean it really good with vinegar/water. It's my go to disinfectant in the kitchen. I put on one coat and the coverage was typical of one coat of paint. The amazing thing about chalk paint is it dries almost immediately. So as I was finishing the first coat I was able to go back and immediately start the second coat. This was the second coat. You can still see the brush strokes, but there is something about that third coat that makes the magic happen. Also as you go you get the technique of how it works. It you brush over an almost dry spot, the paint may rub off. If you wait until it dries it goes on much more smoothly. Also I found dipping the brush frequently helped since the paint started to dry on the brush if I waited too long. I apologize for the dark photos. Yeah, I started this project the night before pictures. Yep I'm a procrastinator. And here she is the next morning! I was in love. I may have stroked her a few times. There were a few places I missed that I will eventually go back and fix, but for pictures it was good. I was thrilled at my "last minute" project and the lovely results! Also the chalk paint needs to be sealed eventually. I plan on adding a clear coat (maybe in satin) over this. Annie Sloan has her own, but for a pretty penny. The feel of the chair is almost "soft". It's a flat finish but it's not cringe worthy (like a chalkboard). **Contains affiliate links. Read my disclosure policy here. 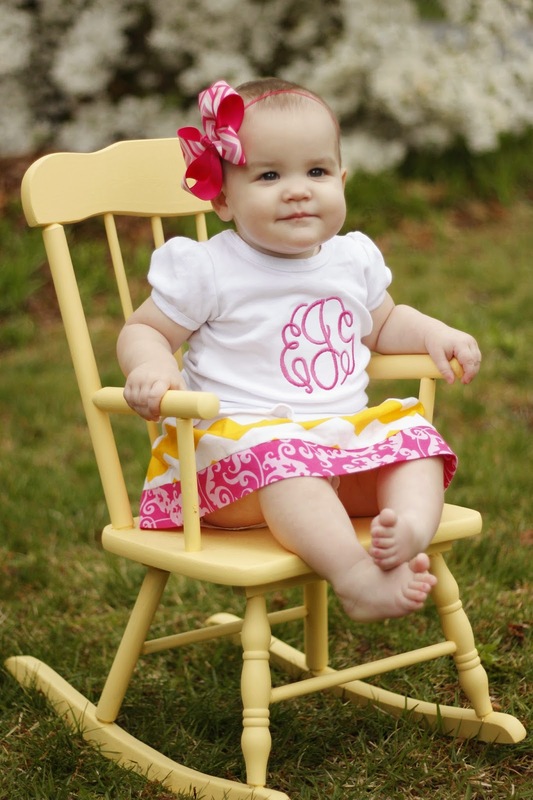 You are my sunshine: Guess who's ONE!